Viewzi brings us a new visual way of presenting information. Instead of one long (boring) list, you get a nice visual view tailored for the content you are looking for. Viewzi provides users with 16 unique ways to view search results: Video x3 view with results from Youtube, BlinkX and Veoh, Web screenshot view which searches Yahoo, 4 source view with results from all 4 of the top search engines (Google, Yahoo, Ask.com, and MSN), Basic photo view shows images from popular image sharing sites Flickr and Riya, and many more. The service loads in browsers such as Firefox, IE 7 and Safari. It requires Flash 9. Thanks Viewzi, we love it! If you want to keep up with latest news, try Addictomatic. Addictomatic lets you find news, videos, photos and blog posts by searching the best live sites on the web. It collects headlines, photos and videos from a number of RSS feeds and presents them in boxes so you can see the results from lots of sources all at once. It’s the perfect tool to keep up with the hottest topics, perform ego searches and feed your addiction for what’s up and what’s now. Founder of Addictomatic is Dave Pell who on the website claims to be the victim of internet overuse with a short attention span and a dwindling social life (which we in a way can relate to). This is not a traditional search engine. It is not going to help you find your new adorable dog or plan your next trip to Peru. However if you want to know what’s going on with Hillary and Obama, and much more, your are at the right place. This is a useful tool to actually find the content you are searching for. 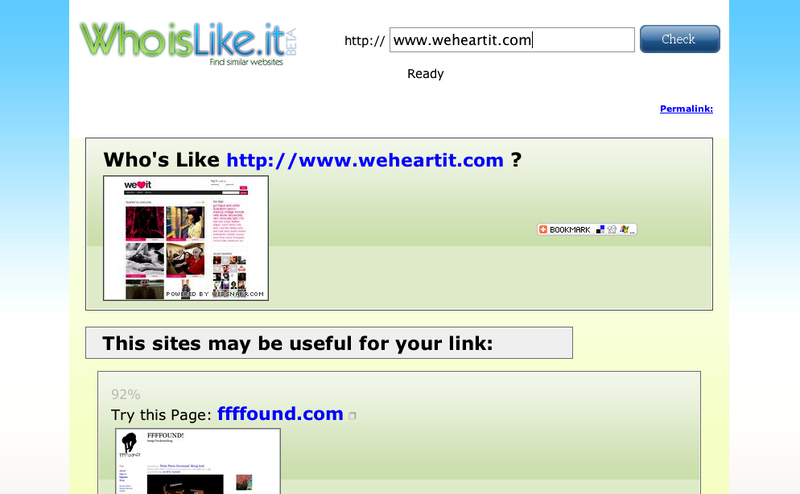 Who is like it will display similar web pages to a requested website. Type in an existing site, hit ‘check’ and browse the results… It’s simple and it works.